For nearly half a century, the infamous Alan Probe has been forced to retire his career as a surgeon. However, several patients with illnesses that have been classified as "too weird" now need his help once more. Take the lives of comical people into your hands and help Alan become a respected physician once more. There are 20 patients for you to treat, each of them needing multi-step surgeries. Many medical tools from the first Amateur Surgeon make their return and join the several new ones Alan's acquired in his time off work. These 10 items include the pizza cutter, vacuum, lighter, and car battery and can be upgraded to 3 levels. The heartrate monitor and time limit are shown in each level, and failure of any or both of these will lead to a flat line. You are graded from A to F on each operation, depending on the how much blood you splatter everywhere and the amount of time reamining. 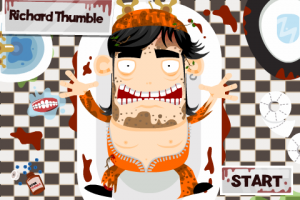 General gameplay feels similar to the first Amateur Surgeon, with a few tweaks here and there. 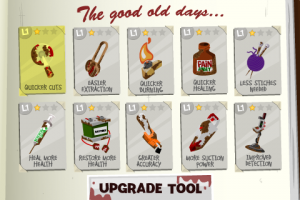 The item upgrade system is superb and allows you to make your cherished tools more effective. The staples have been replaced by a stitching system in which you drag your finger back and forth over the chosen area. A syringe that increases a patient's heartrate has taken the spot of the corkscrew. Openfeint achievements and a grading system will have you playing each surgery until you earn an A on all of them. As in most sequels, the artwork and controls have been slightly improved to make gameplay smoother. Often times you will need to operate on internal organs, which look better than before. A zoom system lets you achieve more precision regardless of what you're trying to do. The dialogue is hilarious, and Amateur Surgeon 2 is one of the few iOS games that will make you chuckle at least a few times. 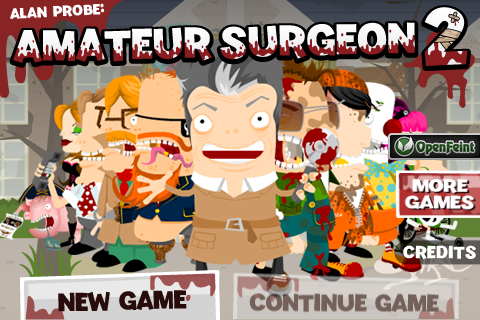 Unfortunately, there have been some changes that seem to make Amateur Surgeon 2 lack the quality of its predecessor. Levels are much harder than before and you'll run out of time even on the first few levels if you don't operate in a rush. Unintentionally, the upgrade system tones down your starting tools to the point where they're not very useful. The stapling system was much easier to use than the stitching, which will sometimes be unresponsive even if you do it correctly. Amateur Surgeon 2 isn't compatible with Retina Display and doesn't have much content. Although the surgeries are fun to execute, there are only 20 (compared to 30 in the first game) that are all rushed through because of the very limited amount of time provided. You'll likely finish all the operations within an hour or so. The surgeries can be performed again after completion in order to get a better score, but the game loses any replay value it once had after you get an A on all levels. 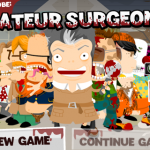 Amateur Surgeon 2 does add some neat features that make it a lot of fun, but you'll feel like the game is over after a few plays. The game is far too difficult and the entire campaign requires a lot of imprecision and rushing that takes away the authentic surgical feel. If you liked the first game, then this one should be enjoyable as well unless the new stitching system bothers you too much. Amateur Surgeon 2 is worth considering for the current sale price of $0.99, as it is a really short game that looks and plays great.